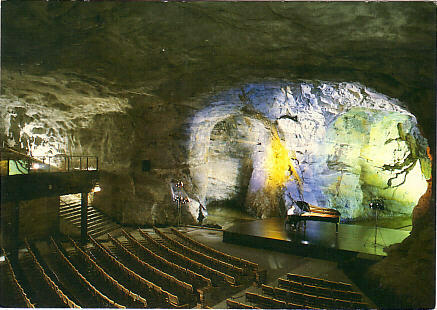 Arts centre ("Taidekeskus"), located in a complex of man-made caves in Punkaharju on Tuunaansaari Island. The complex contained an art gallery and a concert hall ("Konserttisali"). Concert hall also used as a venue by the Savonlinna Ooperajuhlat Opera Festival. Closed 2012. Reverse Text: "Savonlinna Oopperajuhlat - Savonlinna Opera Festival ... Taidekeskus Retretti: Konserttisali"